Here’s how the Democratic candidate could shape external policy if she clinches victory on November 6. 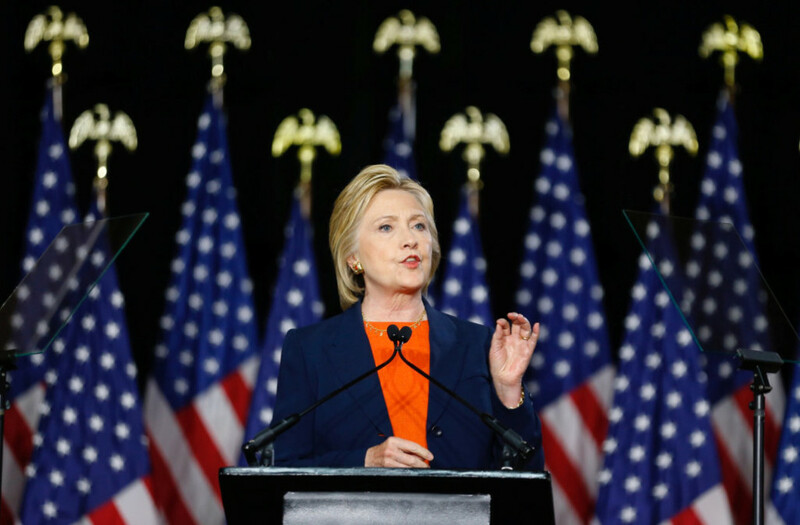 While slightly more hawkish and protectionist than Barack Obama, Hillary Clinton’s foreign policy will likely represent a broad continuation of the current administration on most matters. Her political history also suggests she is pragmatic in her decision making and will likely explore numerous alternatives to achieving her foreign policy objectives. Below, we explore three key regions where Clinton’s decisions are likely to significantly impact global trends. 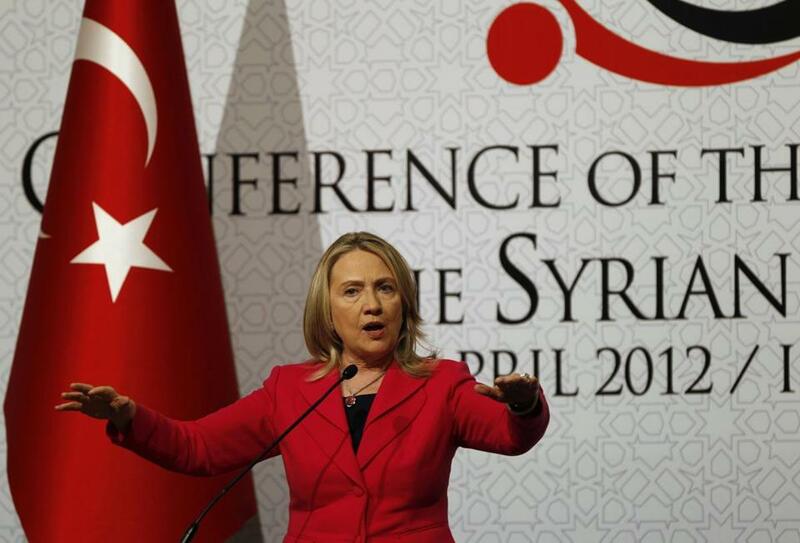 Then-US Secretary of State Hillary Clinton speaking at a “Friends of Syria” conference in Istanbul in 2012. Photo: Reuters. Clinton’s proposed no-fly zone in Syria is one of the biggest departures from Obama’s administration. She will likely raise regional tensions if she remains committed to this election promise. Russia – having warned the US against attacking Syrian forces – is quickly securing its military presence in the country, and has deployed anti-ballistic missiles capable of targeting aircraft. Under such circumstances, enforcing a no-fly zone could dramatically increase the risk of escalating tensions with Russia. It is unclear whether Clinton, who as Secretary of State sought to ease tensions between the US and Russia, is willing to risk such an escalation with Russia once in office. The feasibility of enforcing the plan without Russian and Syrian cooperation can also be called into question. Their air defences would have to be disabled to protect US aircraft, according to General Martin Dempsey, former chairman of the Joint Chiefs of Staff. In both Iraq and Syria, Clinton remains committed to training and supporting rebels and Iraqi security forces in the fight against ISIS. While supporting an anti-ISIS coalition is a continuation of Obama’s policies, her efforts to dismantle terrorist groups will be challenged by the vacuum left by an increasingly divided Iraq and Syria. This could possibly lead to deeper involvement of US forces. Iranian, Turkish, and Russian involvement in both countries will also make the Middle East an increasingly complex region to operate in. Iran’s deep involvement in Iraq and Syria could be either be a point of cooperation for the US – as seen in their tacit cooperation in operations against ISIS in Iraq – or, more likely, a point of contention. Nevertheless, Clinton’s support for the Iran nuclear deal will likely continue to normalise the US-Iran relationship. As can be expected, some minor hiccups along the way are still probable, especially over matters of regional stability, Iranian posturing or Iran’s humanitarian record. Clinton, who noted on the campaign trail that Iran will likely try to test the new president, has promised to explore sanctions over such matters. If Iran does acquire a nuclear weapon – contravening the Joint Comprehensive Plan of Action – Clinton has promised war. 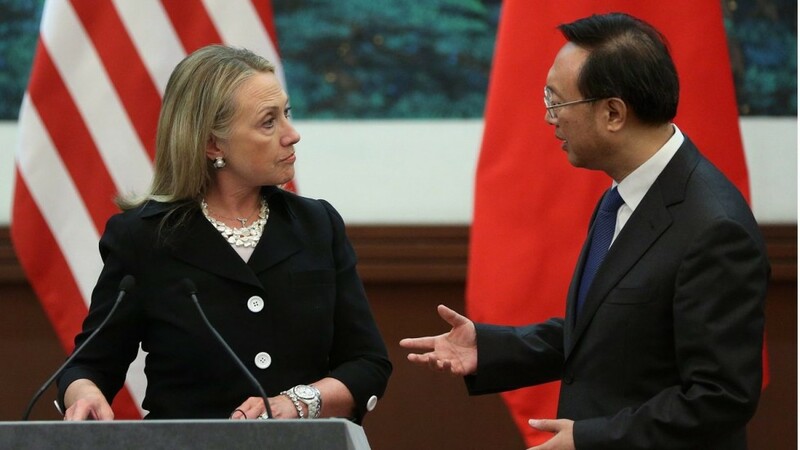 Then-US Secretary of State Clinton meeting then- Foreign Minister of the People’s Republic of China, Yang Jiechi, in Beihing in 2012. Photo: Ministry of Environmental Protection of the People’s Republic of China. A major campaign promise of Clinton’s has been to “hold China accountable” for issues of cybersecurity, human rights, territorial disputes, and trade. Her past commitments to use “smart power” – a combination of soft and hard power approaches ranging from military exercises and posturing to economic sanctions – suggests efforts to increase economic and military cooperation in the region with US allies are likely. Clinton’s promise to end the budget sequester on defence spending will allow the US military to take a more proactive role in the region. This is especially true if she hopes to move 60 percent of US naval assets to Asia, as envisioned under Obama’s “pivot” strategy. Likewise, as a particularly well-travelled Secretary of State who laid the ground work for the pivot – and one who took centre stage in cultivating personal relationships in Asia – Clinton can also be expected to utilise these relationships publicly to shore up diplomatic support against China. China’s diplomatic and economic attempts to win the support of South East Asian states – most notable with the Philippines realignment with China and Russia — will challenge her efforts. The Trans-Pacific Partnership (TPP), while framed as a domestic issue in the presidential campaign, is one such way to increase economic cooperation in the region. Despite supporting the TPP as Secretary of State, Clinton has opposed the partnership throughout her presidential campaign and proposed a new office for Trade Prosecutor, responsible for enforcing trade agreements. However, Clinton’s ability to oppose the partnership as president depends on several factors – Congressional cooperation and whether Obama manages to pass the TPP before the president elect takes office – and the Trade Prosecutor’s powers remain unclear. Alternatively, she may seek compromise on the TPP. While her campaign has tried to downplay this option, her platform commitment to support trade agreements that raise wages, create jobs, and enhance US security opens her up to the possibility of supporting an amended agreement. Clinton is also committed to multi-party talks and stronger allied missile defences in the region to end North Korea’s nuclear weapons programme. While China will see common ground in reining in the hermit kingdom, strengthened missile defences in US allies could be seen as a threat to China’s ambitions. 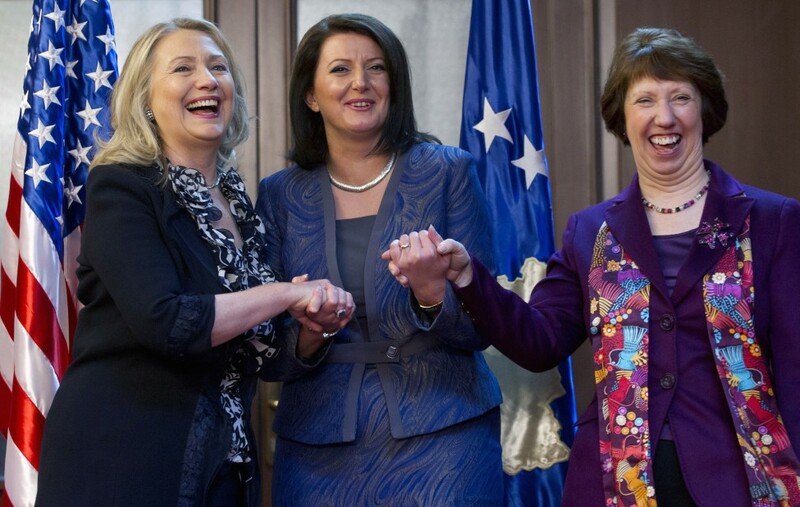 Then-US Secretary of State Hiliary Clinton (L) meets Kosovo’s then-President Atifete Jahjaga(C), and then-High Representative of the Union for Foreign Affairs and Security Policy, Catherine Ashton (R), in 2012. Photo: Reuters. Clinton’s promise to end the defence budget sequester will also help her strengthen US alliances in Europe. As a result, a Clinton administration will likely see increased spending on the build-up of NATO forces along Russia’s periphery. As with China, she has also promised to be “firm but wise”. Throughout her campaign, she has stated her intentions to seek areas of cooperation, not unlike her efforts to “reset” US-Russian relations while Secretary of State. Alternatively, she has also promised to explore more economic sanctions – to punish Russia’s involvement in Syria and Ukraine, and to improve Europe’s energy security – to reduce Russia’s influence over European states. This will likely antagonise Russia and its allies. In addition to the increased military build-up in the region, both Russia and the US will seek to increase their influence over ex-Soviet states through economic and political cooperation. Clinton has shown a strong interest in increasing support for the Ukrainian government. During Russia’s annexation of Crimea, she urged the US to offer Ukraine more financial and military aid. To continue this relationship, Clinton will likely lead ongoing discussions herself – she never shied away from the spotlight during her time as Secretary of State – or choose a point-man to continue this support, either from the White House or the State Department. This is possibly one of the reasons Clinton was reportedly considering current Vice President Joe Biden as Secretary of State, whose hands-on approach to building strong personal relationships with Ukraine would have ensured a smooth transition between administrations for ongoing aid efforts. Biden has, however, since stated he has no interest in serving in the next administration. As the Brexit looms and internal divisions deepen in EU states, Clinton may have difficulty rallying Europe as a unified political, economic and military force against Russian ambitions. If elected, Clinton can be expected to be tested by Russia and China, both of which will seek to expand and strengthen their respective regions of influence. Despite her hawkish rhetoric, she will likely explore sanctions and international cooperation to counter these efforts. She won’t actively seek war except in extreme circumstances. Nevertheless, the potential to escalate a conflict with Russia in Syria exists. While the risk of escalating a conflict with China are not as high – except over, possibly, the South China Sea dispute – tensions between China and the US will likely rise as Clinton continues the US’ pivot to Asia.